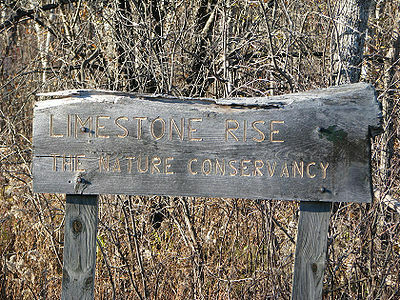 The Nature Conservancy owns and manages Limestone Rise Preserve. More information here. Limestone Rise Preserve lies on both sides of State Route 146 (Township Road) in Knox. Parking is on Nash Road. The preserve starts at a trail passing through through fields and young forest, crosses Route 146, goes up over a limestone cliff, and loops through mature woodlands with many limestone sinkholes and crevices. This 61-acre site protects a variety of habitats in the town of Knox, about 20 miles west of Albany. Natural communities include limestone cliff, rocky ledges, deep fissures, pond, wetland, young red maple–aspen–white pine lowland forest, and older hemlock–white pine–maple upland forest. The rock exposures host a variety of clinging vegetation, such as ferns, mosses, and lichens, a few of them rare. The woodlands are an important nesting habitat for numerous birds. The ledges of Manlius limestone mark the tail end of the Helderberg Escarpment. Talus at the bottom of the rock ledges often contains marine fossils from about 500 million years ago. The preserve is owned and managed by The Nature Conservancy. The area was donated to the Conservancy by Earl and Jane Bucci in the 1970s. The preserve was opened to the public on April 10, 1975. 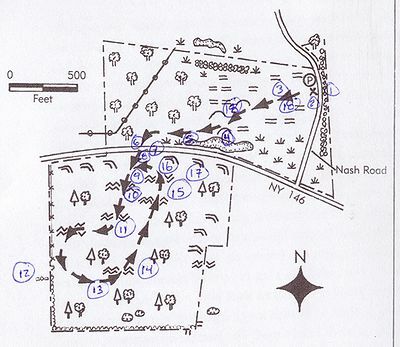 Route 146, which bisects the preserve, is thought to be the old “Palantine Road,” built by Palatine Germans in the early eighteenth century to connect their settlements in the Schoharie Valley with Albany. The area north of Route 146 was abandoned as pasture land more than 50 years ago. The southern area of the preserve was probably never farmed but only used for logging. 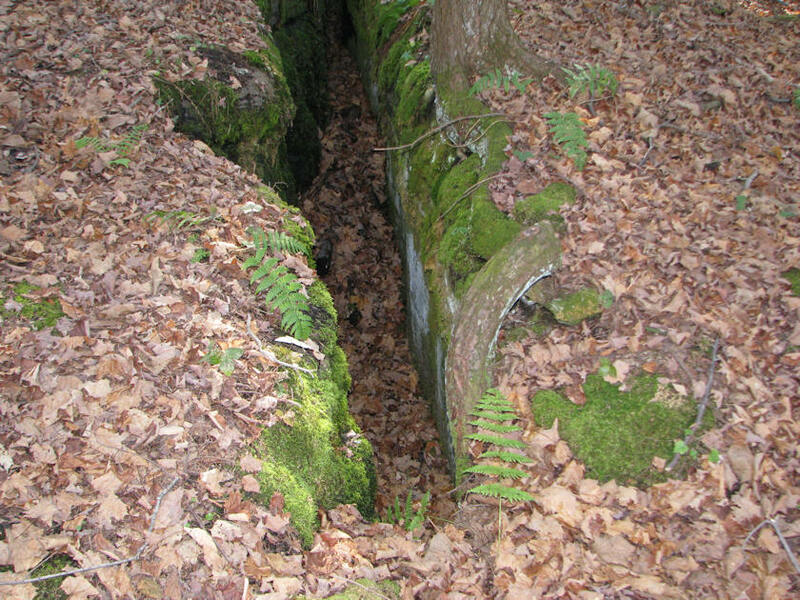 Visitors to this site will find unusual cracks and crevices where rain has dissolved away the underlying limestone bedrock. There is also a fine display of wildflowers in the spring, the most striking of which is white trillium that blankets the forest floor for a few weeks in May. Look for the pileated woodpecker's oblong nest hole -->. A 1.3 mile trail is blazed orange and has a few short but steep climbs. After you cross the road and enter the southern section, use special care to avoid stepping into deep crevices and holes in the limestone, especially in winter or after the leaves have fallen, when the crevices may be hidden. Allow about one hour to complete the circuit. Be sure to stay on the trail to avoid falling into a sinkhole or crevice. 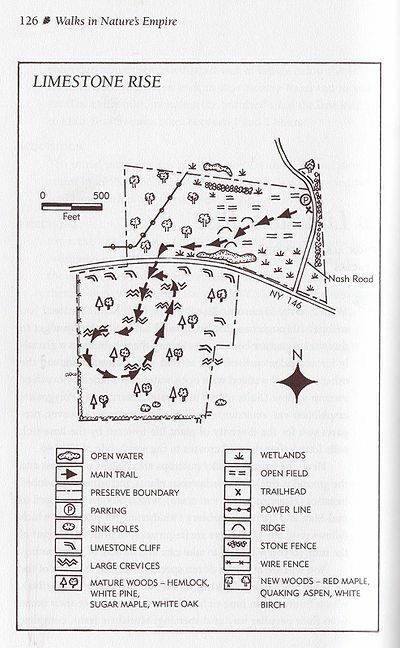 Please see The Nature Conservancy's Visitation Guidelines and download a trail map. Wear sturdy shoes and bring a map, water, a snack and rain gear. 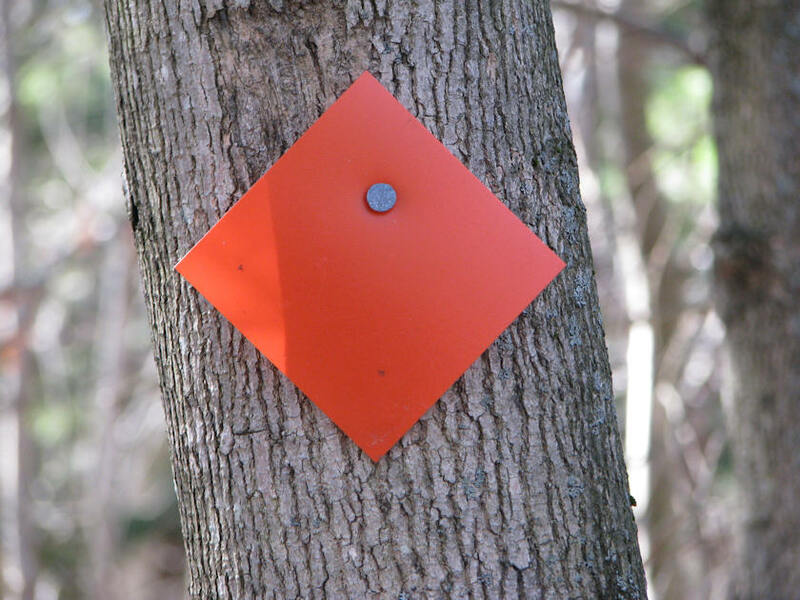 The preserve abuts private property, so be sure to respect those areas. From the Albany area, takes Route 20 and 146 to Altamont. Turn right in Altamont, staying on Route 146. At about 5 miles from Altamont, County 252 crosses Route 146. Continue on Route 146 for another 0.5 mile, then turn right on Nash Road. Turn left, just over 0.1 mile from the turn, for the trail entrance. Note: There is a farm gate on the right, across the entrance. Park along Nash Road, but please do not block the farm gate.